As you enter the lobby of the Disneyland Hotel in California, you’re greeted by a soaring mural of Sleeping Beauty’s castle, with “When You Wish Upon A Star” playing overhead. Outside, three retro-themed pools beckon families for a swim. 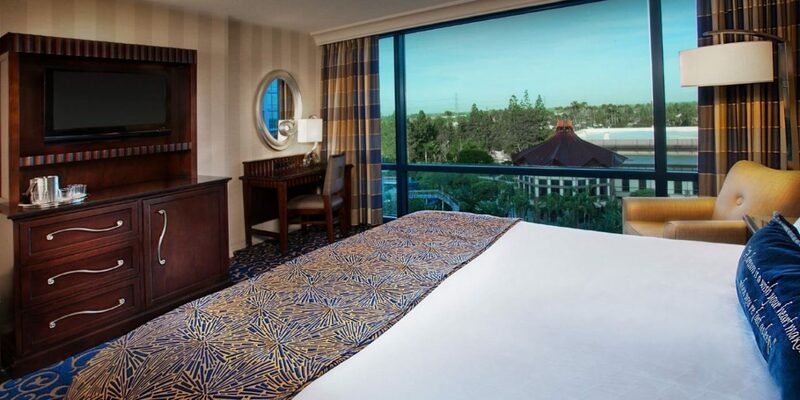 Later, you can marvel at the spectacular view of Downtown Disney from your guestroom balcony (east side of the Dream Tower). Unveiled just three months after Disneyland opened in the summer of ’55, the Disneyland Hotel sits adjacent to the park. 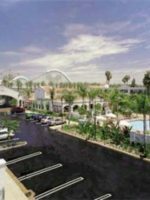 Both are a 45-minute drive from the Los Angeles airport and 30 minutes from John Wayne. With three fancifully named towers (the Wonder, the Magic and the Dream) and 990 rooms, you’ll need to rustle up an old timer if want to hear about the original; every plank of the Disneyland Hotel (including the parking lot) has been leveled, refurbished and re-unveiled throughout the decades. These days, Disneyland is part of a the kingdom called the Disneyland Resort, which encompasses Disneyland, Disney California Adventure, Downtown Disney, Disney’s Grand Californian Hotel & Spa, Disney’s Paradise Pier Hotel, and of course, The Disneyland Hotel. You're paying a princely sum to stay at the Disneyland Hotel, so naturally you expect to find a royal guestroom. Well, the standard guestrooms are fairly basic (more on the spectacular suites in a moment) with beds, double vanities and rather small bathrooms with tub. But for what the room lacks in luxury, Disney makes up for in magical decor, including an etching of the layout of Disneyland plans from '55, light up Sleeping Beauty Castle headboards that can lull you to sleep, and Mickey hands holding up light sconces in the bathroom. The rooms come with free Wi-Fi, a copy of USA Today daily, a small fridge and a hair dryer. Disney no longer equips the rooms with microwaves (you'll find a self service microwave in the Coffee House) or coffeemakers (but you can request one when you register with the front desk). Every room comes with a Pack 'n Play, and you'll find bed rails tucked under the mattress of each bed. If you need assistance pulling it out or erecting it, just call guest services at no additional charge. Your room will receive a thorough cleaning each morning, but make a special request to the front desk if you'd like an evening turndown service. You'll need to keep your stroller with you in your guestroom; special storage isn't available. The one-, two-, or three-bedroom suite options offer king and queen beds, pullout sofas and twin beds. The suites sleep six to 10 guests. Set on a room with a little more splendor? Then the Mickey or princess themed Character Quarters are ideal. These themed suites are fun for kids and adults and sleep six with king, queen and double bed options. A sleeper sofa or day bed are also available. The suite themes include: Adventureland, Ambassador, Big Thunder, Blue Sky, Fairytale, Pirates of the Caribbean Suite, and of course, the Mickey Mouse Penthouse. Learn more about the Micky Mouse Penthouse (and other themed hotel rooms) in Best Kid-Themed Hotel Rooms. When you get to a Disney hotel, you expect some special, now I have been missing this ! For me a normal hotel, not even 5 star level, everything is nice and clean, but as said nothing special and you pay a high price ! Advantage is that is on walking distance from Disney Downtown ! Reception hosts were friendly and helpful. Hotel is not real modern any more. 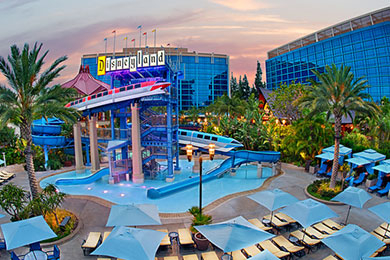 My wife and I have stayed at the Disneyland Hotel once almost every year for the past 15 years or so, as we go for an annual business conference held at the hotel. Disney hotels are necessarily the most luxurious, but they are usually very guest-conscious, and while they tend more towards anonymous, yet friendly efficiency, than "white glove" service, they are usually pleasant places to stay. Our most recent visit, though was disappointing. First, the hotel itself is getting a little long in the tooth. The TV in our room was old and relatively small by today's standards. Our refrigerator didn't work. The toilet seat in our room was not securely fastened, and swiveled as you sat on it. Our bed was comfy enough, but the thermostat seemed to have little to no effect, so the room got a bit warm and stuffy in the middle of the night. The design of the room was very cool 10 years ago, but today, it feels awkward with the bathroom sink in a different room than the toilet, and the light switches outside of the rooms for which they operate. Even at the super-discounted rate we were staying for ($300/night, instead of the usual $450), it just seems completely unacceptable that I can't get a meal at a resort hotel without walking a half-mile or more! At that price, by the way, the additional $25/day to park seems usurious. I hope Disney makes an effort to update their operations at this property, but with a captive audience of park-goers who wouldn't even dream of staying off property, they don't seem to have much incentive. The Grand Californian was slightly better last time we stayed there (10 years ago), but as our conference is at the Disneyland Hotel, it doesn't make sense to stay at the other property. Guests of the Disneyland Hotel enjoy a one-hour early entrance (8 a.m.) to Disneyland on Tuesdays, Thursdays and Saturdays. On Mondays, Wednesdays, Fridays and Sundays, guests can access Disney Adventure Park before the crowds, starting at 8 a.m. 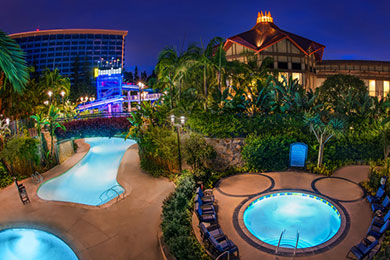 The three retro-themed pools at Disneyland Hotel do not disappoint. 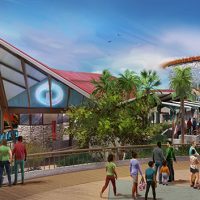 The 4,800-square-foot E-Ticket Pool pays tribute to the early Disney days, and slide and lifeguard hours vary. The Monorail Pool has two, giant winding slides, plus a two-lane mini-slide for smaller children. Kids can splash around in the fountains and waterfalls, too. The D-Ticket Pool is more for swimming laps and relaxing. For a fee, poolside cabanas are available for half- or full-day service. The cabana has a TV, sofa, lounge chairs, mini-fridge and towel service. For a fee, Pinocchio's Workshop invites kids 5 to 12 to enjoy a night of games and activities. From 2 to 10 p.m., kids make arts and crafts, play games and dress up, and watch Disney movies under the supervision of a licensed caregiver. Snacks are provided and dinner can be arranged for an additional fee. On select nights, movie screenings take place on the Magic Kingdom Lawn. Bring a snack and drink and enjoy a Disney classic. Recommended for guests over 14, this one-hour tour takes you on a journey of the history and design of Disneyland Hotel; it is free to guests. In the real world, you'd get "the look" for bringing children into high-end restaurants like Steakhouse 55 in the Disneyland Hotel. But in the "wonderful world of Disney" the staff will roll out the red carpet and cater to your child's every request, even if it's peanut butter and bananas. The fine dining dress code is resort wear or casual dressy. Steakhouse 55 is located in the Magic tower, and is open from 7 to 11 a.m. for breakfast and 5:30 to 10 p.m. for dinner. You will find huge, comfy booths, breakfasts that include steak and eggs Benedict, and dinners that offer sublime Angus steak cuts that you can request to see before they sizzle. Incredible seafood is also on the menu and an extensive wine list is offered. Located outside Steakhouse 55, the Lounge is open from 5 to 10:30 p.m. daily. In addition to the full bar, salads and sandwiches are available for lunch, and a selection of appetizers is served in the evening. No televisions -- just quiet time to talk. 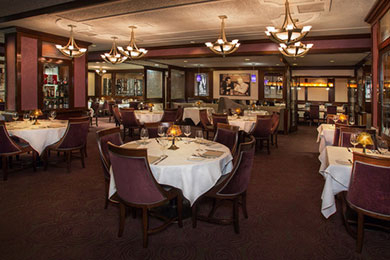 The full Steakhouse 55 menu is also available at the bar. Located next to the pool, the Coffee House is open from 6 to 11 a.m. It's not a bad choice for a fairly nutritious breakfast when you want to make full use of your guest perk and head into the park early. You'll find fruit, sandwiches, salads and more. This tropical hideaway with a Polynesian feel is open from 7 a.m. to 10 p.m. and offers traditional eggs and bacon for breakfast or flatbread pizza for lunch. Meals can be enjoyed al fresco under lanterns or poolside, and kids will have full ordering through the touch-screen kiosks. Open for breakfast and dinner, Goofy's Kitchen is THE place to meet the characters. Reserve your spot as far in advance as possible. The "Fab Five" includes the star, Chef Goofy, Mickey, Minnie (who is quite the party gal), Pluto and Donald, who put on an enthusiastic show involving the kids at every twist and turn. When the Fab Five need a break, it's not uncommon for a cluster of princesses to make an appearance. Disney lays out a vast breakfast: waffles, eggs, pancakes, and everything a breakfast lover expects to see, plus extra splurges (it's vacation, after all!) -- macaroni and cheese pizza included! When you first are shown to your table, seat the kids as close to the action as possible and yourself across from the kids so you can get good photos. Inspired by the Jungle Cruise, this Tiki bar offers numerous colorful cocktails. Burgers, Asian wings and sandwiches are also offered. The Tiki Bar is open from 11:30 a.m. to 1:30 a.m. and children are welcome until 8 p.m.
Made-to-order dishes are available any time, but there is an 18 percent gratuity, delivery charge and sales tax applied to each order. Your Key to the Magic card is your room key, resort charge card and parking permit. You receive the card at check-in and can use it to purchase items, meals or tickets at the hotel or theme parks. Cast members hand out balloons and "first visit" or "birthday" pins to the kids at the front desk. 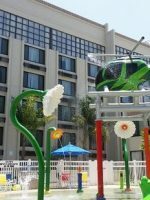 An outside company provides in-room childcare for infants and kids for an hourly fee, should you want to enjoy a date night in Downtown Disney. Treadmills, bicycles, ellipticals and stair climbers are available to guests seeking a workout at Goofy About Fitness, open 24 hours. Or get up and go on a 2-mile, group power walk through Disney California Adventure Park. The walk starts at 6 a.m. and children over 14 are welcome. Strollers and cameras are not welcome. It's nothing fancy, but this room provides five washers and dryers and all of the soap support you need to keep the kids as clean as possible during their Disney days. No need to carry those souvenirs with you all day long. Items purchased at the theme park can be delivered right to your hotel at no charge. And you can pick the item up at the Bell Service desk when you return. The quietest, most decked out time to visit? The weeks directly after Thanksgiving until Christmas week are cool beyond belief because the crowds are seriously down and the holiday lights are up. January 4 through the first week in March is also serene. During early fall, the southern California weather is gorgeous, and the crowds are so small that the Disney cast members almost seem to out-number the guests! The downside is that when the park becomes quiet, the Disney engineers become active and take the opportunity to repair and enhance the rides so you may find some closed attractions. During Christmas, Santa visits each afternoon and strolling carolers perform throughout the hotel. At Halloween, the front desk staff hands out candy. If you're visiting during a holiday, just ask what the holiday happenings are inside the hotel. 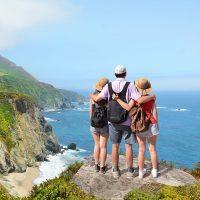 Southern California weather can at times be chilly during fall, winter and spring months so pack accordingly. Rain is more likely November through April, with the rainiest months being January through March. Mid-August to mid-September are the hottest months; to cool down, pack spray bottles for the park. Bring light sweaters for evenings, and rain gear in the winter. 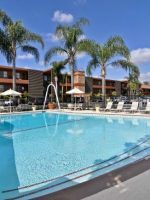 Disneyland Resort is located in Anaheim, California, about a 40-minute drive from Los Angeles International Airport, but more easily accessible via John Wayne Airport or Long Beach Airport, both in Orange County. Free parking lot trams bring guests to Disneyland and Disney's California Adventure Park. There is a fee for both self and valet parking. Back in the day, the Monorail stopped at the hotel, but today you need to walk an three minutes into Downtown Disney to catch the Monorail, which will let you off inside Tomorrow Land. Guests can also enter and re-enter Disney California Adventure Park using a special entrance. Mom (and maybe dad, too?) will salivate at a luxury visit to Disney's Grand Californian Hotel's Mandara Spa. Located within the Grand Californian, this luxury spa and salon offers the works, including couples' massages, men and women's separate steam rooms, a world class fitness room and an impressive menu of luxury spa treatments.